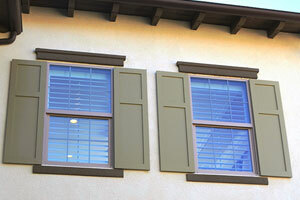 Exterior shutters add curb appeal to your home and enhance the look of commercial properties. They are typically painted in vibrant colors as well as black and shades of browns. These are the most popular style for the exterior and can be built in basswood or poly. They are typically manufactured in 2 ½” louver size which can be fixed closed or partially open. These are the most popular choice used by builders for new homes. This style is built in basswood, custom built to your specifications. These are a classic style built with vertical “boards” and horizontal boards known as “battens”. These are another popular choice for new home builders, and are built in basswood to your specifications. For a FREE estimate, give us a call today at 951-845-8786, or fill out our contact form to gain more information about our company.